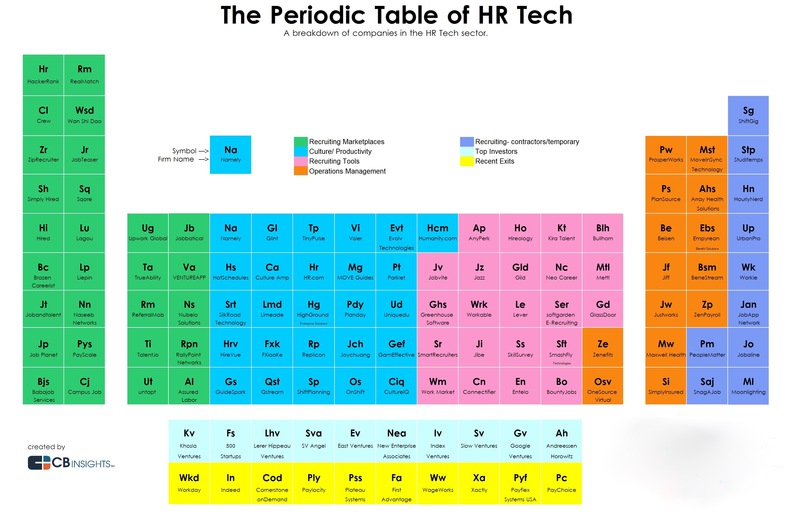 The Landscape of HR Technology: Startups and VCs (Infogrpahic) | What's The Big Data? The top section of the table contains highlighted HR tech startups, while the bottom two rows list notable recent exits and top investors. Recruiting marketplaces: Companies including HackerRank and Crew Labs create online marketplaces and information-sharing sites for job searchers and recruiters. These services help connect employers and candidates with the hopes of improving hiring outcomes. Culture and productivity: Companies like Namely and HotSchedules make HR software that focuses on helping employers observe, evaluate, and improve company culture and individual productivity. Recruiting tools: Companies such as Jobvite, Glassdoor, and Greenhouse Software create tools that help employers search for, attract, and hire qualified candidates. HR operations management: Companies like Zenefits, BeneStream and Beisen create software that allows companies to manage their operations including payroll, compliance, and insurance on efficient platforms. Recruiting contractors and temporary workers: Companies including PeopleMatter and Snagajob specialize in helping employers hire part-time or wage workers. These companies often target the restaurant, retail, and hospitality industries. This entry was posted in startups and tagged HR, Human Resources Technology. Bookmark the permalink. Thank you for the article about HR technology start-ups, it was very interesting and informative.